buffygirl wrote: If river is River, then who is Sea? I wish to be dazzled by the creativity of the Exalted Haberdasher when challenged to produce a hat worthy of wearing to brunch. I must thank you for introducing me to Monsterpiece Theater through your repeated references to it. Is he decrenneling now? At this point I'm going to have to agree with the theory that M&C's plan is to raise the sandsemencoffeecaffinatedbabycancericepixeltoner-castle* to the platform in order to protect it from the rising tide of Time. I had still been leaning towards the loopist school, thinking that the rising liquid-to-be-determined would wash everything away and then recede. Afterwards, M & C would come down from their platform, dis-assemble it, and then have a sit down on the once-again empty beach (return to TimeFrame 1). And it will all start over? Loopists predict that the One True Comic will recycle back to its starting point in some way, creating an Endless Loop. Others believe it will end at some finite, specific, NewPix, perhaps with the long-awaited punchline. Still others believe that it will continue endlessly with no recurring pattern. Finally, there are those who predict an End of Time with no specific payoff, either through some form of comic entropy, termination of servers, or the loss of Lord Randall in some fashion. No one knows for sure. All we can do is Wait for it. I want it to continue forever, but I think it might end with a punch line. Mostly I don't think it will loop, but it might. After careful consideration, I must proclaim herewith that I am not, and have never been, a Sandmason. What, are you hallucinating again? 1At least I think I do. He decrenelated nothing. Nothing was decrenelated. What was thought to be a decrenelated wall was a pile of semëncancërcoffeëbabië behind the semëncancërcoffeëbabië wall, as revealed last nüpiks. What if it loops, but at some point diverges from the loop? Sort of a variation on continuing endlessly, except if that's a possibility then we must wait forever, even if it appears to loop. jjjdavidson wrote: After careful consideration, I must proclaim herewith that I am not, and have never been, a Sandmason. Eeeexcellent!! Now fill it up with petroleum distillate, and revulcanize my tires, post-haste! Umm, I mean send me all your money. That would be an interesting test of our faith. Proposed insignia for the Knights Temporal. The far left edge of the sand has a tiny, tiny slope upwards (present in both this one and the previous frame). I think this means that there's more to the sand castle than we see. Also where is the missing vertical feature from the mini scene? I printed out this whole forum post and handed it out to a village. None of them found reference to this missing feature. The original trebuchet, which has since been moved. Edit: snipped instead of spoilered, because apparently spoilering from a phone is too hard. I believe that's the mini-trebuchet. Edited to fix tag nesting. Last edited by SBN on Wed May 01, 2013 11:28 am UTC, edited 2 times in total. Why has no one come up with a reasonable explanation of how the platform/boards/ballisters/railings/bucket/sand/cueball/who-knows-what-else are so securely balanced on four linearly placed vertical posts without falling over? 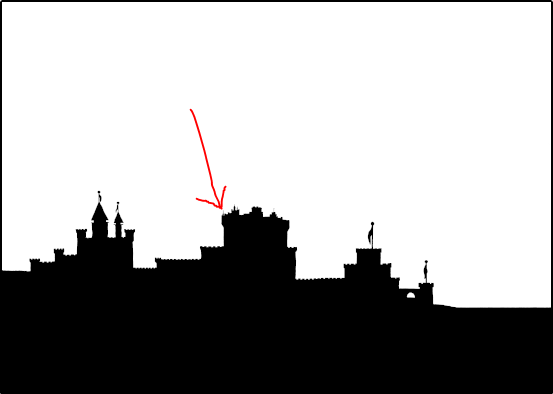 If there weren't apparent movement behind the castles (has it been determined whether the platform is behind the castles, or in front of them? ), the balancing act would lend credence to the theory that this is flat world. On the other hand, if it was flat world, various things like Cueball, Megan, the boards and the ladder wouldn't be seen as different from the front and side views; they would only have one view. And a flat trebuchet wouldn't work. OK, so it's 3-D and the actors here have a sense of balance worthy of the best Ringlling Brothers act. But, notice the ladder; when the platform was first being built, Cueball placed the ladder edge-on to us. In that position, they were unable to reach it from atop the platform. It has been repositioned now flat to us and leaning on the same pole as before. In this position, the top of the ladder is actually further from the edge of the platform than it was before, yet the platform is now somehow accessible? I think we're left with the only conclusion - none of this is real. It's just a made up comic world with no reality. Oh sure, there are those of you who will profess that the Lord works in mysterious ways. That may be but even mysterious ways have some grounding in logic, physics and reality. Davidy wrote: Why has no one come up with a reasonable explanation of how the platform/boards/ballisters/railings/bucket/sand/cueball/who-knows-what-else are so securely balanced on four linearly placed vertical posts without falling over? If there weren't apparent movement behind the castles (has it been determined whether the platform is behind the castles, or in front of them? ), the balancing act would lend credence to the theory that this is flat world. On the other hand, if it was flat world, various things like Cueball, Megan, the boards and the ladder wouldn't be seen as different from the front and side views; they would only have one view. And a flat trebuchet wouldn't work. OK, so it's 3-D and the actors here have a sense of balance worthy of the best Ringlling Brothers act. But, notice the ladder; when the platform was first being built, Cueball placed the ladder edge-on to us. In that position, they were unable to reach it from atop the platform. It has been repositioned now flat to us and leaning on the same pole as before. In this position, the top of the ladder is actually further from the edge of the platform than it was before, yet the platform is now somehow accessible? I think we're left with the only conclusion - none of this is real. It's just a made up comic world with no reality. Oh sure, there are those of you who will profess that the Lord works in mysterious ways. That may be but even mysterious ways have some grounding in logic, physics and reality. Notice how Cueball and Megan don't have horizontally aligned feet. their feet are downward-pointing spikes, and they carried out this balancing act by stabbing their feet into the poles/planks. Since Cueball is going to be piling sand on the edges for the next 36 newpix (Outside time: the weekend)... I think I might actually venture out there. Looks like no one else has gotten around to it yet . . . I think it's a very interesting idea. Let's say, a loop, going on forever, only the DIALOGUES change each cycle. I think it can be a cool game to try and replace the dialogues in past and future frames with alternative dialogues. On the other hand, people got themselves stoned for less radical ideas (using real stones, not by smoking stuff). Can someone — anyone — please get Cueball a front loader?! I cite the ancient texts that have yet to be written, "For it is through the One Who is to Come that all paradoxes will be resolved, and she will reign till the end of Time"
But since when does life ever have a satisfactory resolution? Valarya wrote: Since Cueball is going to be piling sand on the edges for the next 36 newpix (Outside time: the weekend)... I think I might actually venture out there. I can't believe what I've just read. How many Inquisitions do we have? Bring them all! What if there are eight poles? As our view seems to be rather lacking in depth-perception, might there be two poles every place we observe only one; one of the pair in front and one behind? The funny triangle things on either end may simply be what the railing we "see" looks like in profile. And, assuming that the lines intersecting cueball are indeed a railing in front of him, there may be one behind him as well. Just because you can't see it, it doesn't mean it's not there. Last edited by elementropy on Sat Apr 13, 2013 10:05 pm UTC, edited 2 times in total. Eliram wrote: I think it's a very interesting idea. Let's say, a loop, going on forever, only the DIALOGUES change each cycle. Elementropy, Time Bandit, TimeWaiter Liturgist, Oxford Comma, and A Greek Omelette with Fries and Tomato Juice, Hold-the-toast-please in the Order of Breakfast, I, Timewaiter Arch-Cardinal Buffygirl, She who Rises From The Flames Like A Phoenix To Continue With Her Pursuit of Hat Perfection, do hereby present you with your hat. Erm ... well, I think those are actually vines/leaves but ..... Wait, no, yes! OF COURSE they are stars!!! What on earth was I thinking!??!! Edit: I recognize that the hats I have gifted have become more intricate over Time. Thus, if anyone to whom I have already bestowed a hat finds themselves dissatisfied with their hat, here is what you must do. First, repent. A lot. A whole lot for disrespecting a gift from the Arch-Cardinal. Then come to me and I may have mercy upon you and adjust your hat to something more fitting. Last edited by buffygirl on Sat Apr 13, 2013 10:24 pm UTC, edited 1 time in total. Ah, nuts. The Outside world made me forget which way I was facing. The post will be fixed when the Paradox is resolved. SBN wrote: What if it loops, but at some point diverges from the loop? Sort of a variation on continuing endlessly, except if that's a possibility then we must wait forever, even if it appears to loop.